We love the sweet heirloom apple cider we make at Landmark Trust USA’s Scott Farm. The blend of apples changes with the ripening of our heirloom varieties at our orchard in Dummerston, Vermont. We are lucky to have friend and fellow Vermonter, Jason McArthur, teach a hard cider workshop each fall at Scott Farm’s historic apple packing barn. Contact Landmark Trust USA’s Scott Farm, kellyc@landmarktrustusa.org, for workshop dates for next fall and in the meantime we recommend you add cider books to your own library! We have a signed copy of Cider, Hard and Sweet: History, Traditions, and Making Your Own by Ben Watson published here in Vermont at Countryman Press. 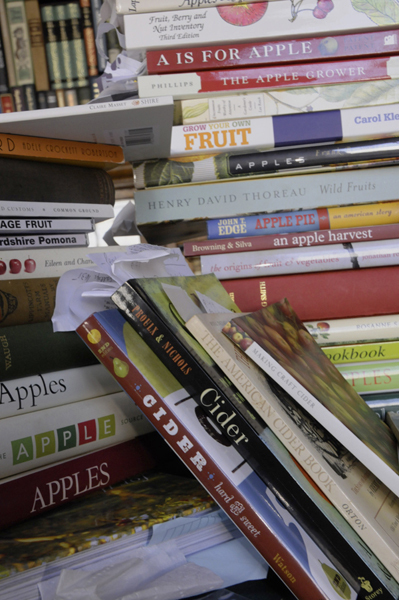 Annie Proulx and Lew Nichols wrote Cider: Making, Using, and Enjoying Sweet and Hard Cider. Our third edition was published by Storey. The American Cider Book, The Story of America’s Natural Beverage by Vrest Orton. Our copy has been well thumbed and shows signs of age. Please ask Jane Booth for permission to reproduce her copyrighted photographs and/or writing. Email jane.booth.1@gmail.com or call (802) 258-3971. Jane has spent a good part of her career photographing and writing about gardens and small farms for Gardens Illustrated, Yankee Magazine, Country Living, Country Living Gardens, Better Homes & Gardens, New Old House Journal, and Cape Cod & Islands Home where she produced an ongoing column and feature stories. This entry was posted in Sweet and Hard Cider, Sweet and Hard Cider - Books on October 17, 2012 by Jane Booth.